I love my neighborhood, and as i've mentioned before, I feel like I started really living once I moved here. I mean, i've been alive for 27 years- blood pumping, senses alert. But hearts beat for community, and so in moving I began to live and breathe relationship in a new way. Last year, I participated in a program called Our Children. For a few months, I became part of a special group of 4 women- two of us from an English speaking church and two from a Spanish speaking church. Coming together every other week, we worked through a bible study called Strangers in the Land, learning what the Bible has to teach us about immigration. Stories were shared, hearts were open, tears were shed, understanding illuminated, and bonds of deep friendship were formed. All of a sudden immigration wasn't this foreign issue spread in the newspaper, dripping with fear and often times animosity. No, immigration became personal, I heard my dear friends share their stories of God's hope and mercy. I learned that more important than our label as "American", comes our allegiance to the one who paid it all for us- "Christian". And as a Christian, we are called to love our brothers and sisters in Christ. We love others because Christ first loved us. We open our homes because Jesus would have done the same. When we turn away or reject someone because of man-made regulations, we hurt the heart of the Lord. Our citizenship is ultimately in heaven, not in geo-political boundaries. As a group, the 4 of us would lead workshops for precious girls in an immigration shelter. Young girls who were caught crossing the border. My heart ached for these little women- each with a story that pulled strings I didn't even know I had in me. However lost and confused, these were Abba's special ones. I longed to hug them and play with their hair, but rules denied us such expressions of love. 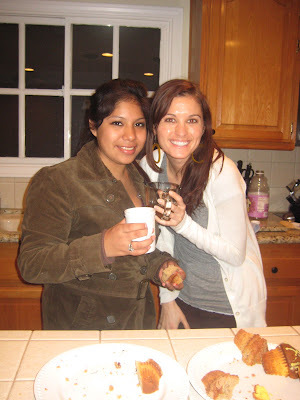 One night, I accidentally bent the rules and hugged a sweet girl from El Salvador. She looked at me and said "I haven't felt loved like this in a long time". I went home that night and bawled like a baby, those rapid uncontrollable stuttering sobs. And in the midst of salty tears, the Lord spoke to me in gentle whispers..."Katie, there are girls in your neighborhood that need love too." And so "girls-group" began as a prayer. A small seed soaked in faith that God would somehow provide a space to reach out to college aged girls in my neighborhood. Odds were against me...I knew almost no girls that fit that age group, I speak no spanish, and had few connections. But with God,the odds are always good. I made a lame flyer, a dear soul passed it out in the neighborhood, and I showed up on the first Thursday and seriously wondered if even one girl would come. And seven girls came. I beamed. That was a year ago...and in the past year I have fell in love with these seven faithful chicas that show up week in and week out. They make me laugh, they are beautiful, and I am ALWAYS inspired by the way God challenges me through them. Some of them face incredible odds, but do not allow circumstances to dictate their future. And so we still meet on Thursdays. We study God's word- we bake- we craft- we laugh (a lot)-we play games- we dance- we sing. And most importantly we breath life into each other. We encourage, and speak truth, and infuse God's deep love. Because ultimately, that is what community is about- calling out the good of God and the good in one another. We are a story of transformation. So whenever I speak of my "girls group", this is the story that precedes. A story of God's handiwork in drawing us deeper into who he created us to be, by allowing situations to change us and inspire us towards something grander. God is so good, His movements in our lives and the lives of the girls has been miraculous to watch! I can't wait to see you all again, very very soon!